The continuation of the previous Company of Heroes game is here: Company of Heroes: Opposing Fronts. I’ve got to say I didn’t play the first so I’m new to it. I like RTS (real time strategy) games, but not all. Starcraft was my favorite so far, and I was waiting for Starcraft II eagerly when I heard of the new Company of Heroes. I’ve got to say I haven’t played anything like it so far. It’s simply breathtaking. The graphics are splendid, and up-to-date, and the game itself brings a whole new dimension to strategy games. This is the kind of game, that makes people buy new PC’s just to play it. 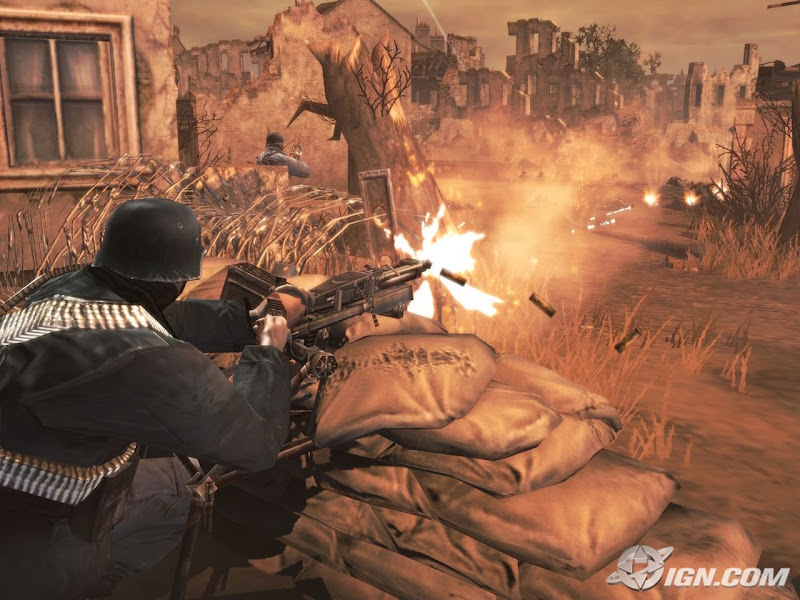 Company of Heroes: Opposing Fronts is extremely well thought out. The sides are well balanced, and the units have several abilities that you can upgrade. How? Well simply by sending them into action, where they earn their veteran status. There are 3 levels of veterancy, and with each one the units get offensive and defensive bonuses, as well as special abilities that you can buy. Did I say buy? Yes. In Company of Heroes: Opposing Fronts you capture sectors on the map, and they’ll give you “resources” like fuel, munition, and man power. Each one is vital to you, because without them you can’t build new units from the base headquarters, upgrade existing units or call in artillery strikes. The sides are very diverse. The two new sides in Company of Heroes: Opposing Fronts are the British and Panzer Elite. The first is a defensive army, being able to digg trenches, and lock-down tanks with sandbags making them very hard to kill. The Panzer Elite is mainly an offensive army with their mobile halftracks and multitude of powerful tanks. After playing almost a chapter of the game (about 4-5 missions) I found that the star of the “show” for the Allies are the 105mm Howitzers and the 105mm Priests. They will obliterate everything you command them to from very far. The ground trembles when they fire, and anywhere you are on the map, if a 105mm gun is firing, you will be able to hear it, giving you goosebumps. Yes, it’s that impressive. The only catch is that every firing mission eats up precious munition resources. So you won’t be able to use it all the time. The missions are well made, literally immersing you into the atmosphere of the second world war. I could write pages about this game, but it’s best to leave some surprises for you to find out. I strongly recommend going down to your local games store and buying it, because this game marks a milestone in the RTS genre, just like Bioshock did for the FPS genre. Below I posted 2 videos one a presentation of the British army by the game’s creators, and the second showing five or six 105mm Howitzer nests wrecking havoc on enemy forces so you can get the idea of its power. * 2.0GHz Intel Pentium 4 or AMD Athlon XP or equivalent. SSE capable processor required. * DirectX 9.0c compatible 64MB video card with Pixel Shader 1.1 support or equivalent. * Recommended System Requirements to support 6-8 player multiplayer and skirmish. * Internet play requires broadband connection and latest drivers. * LAN play requires network interface card and latest drivers.